People that know me often joke that they’ve never seen me outside without sunglasses on…and that’s really pretty accurate! Since an incident I had several years, which I describe below, I now put on sunglasses whenever I go out the door…and I own several pairs. I think the best tennis sunglasses should be lightweight, wrap-around style frames and polycarbonate lenses (shatter-proof!) with 100% UV protection. 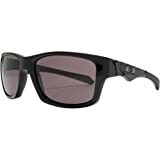 My favorite sunglasses that meet all those criteria are the Oakley Flak Jacket –while many women prefer the smaller profile of the Oakley Half Jacket. Keep reading below if you’d like to see several other top picks (click to jump to detailed reviews) and a complete buyers guide included 5 top reasons why you need to be wearing sunglasses and 3 things you can’t overlook when buying your next pair to wear on the courts. Even if you don’t want to wear tinted sunglasses or if you play on indoors courts (indoor pickleball, racquetball or squash) you really should think about protecting your eyes from ball impact. When I play indoors I wear these ones by Gearbox- if you’re looking at other options for clear protective sports glasses and goggles click here. Not a fan of wraparound sunglasses? Why you should always wear sunglasses when you play racket sports outdoors. What to look for in a good pair of sunglasses for tennis? Best lens color for tennis sunglasses? Why don’t pro tennis players wear sunglasses? The Oakley Half Jacket 2.0 polarized composite lenses have a protective coating offering 100% protection from UV. 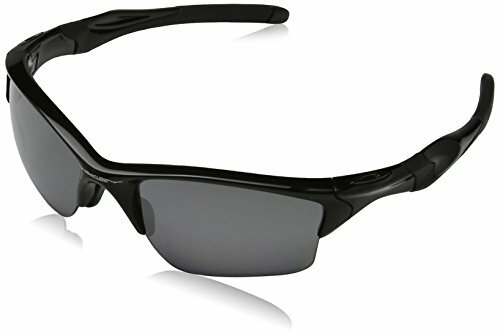 As the name indicates, this is the updated version of the classic Oakley Half Jacket which historically was one of the brands best model of sunglasses. The frame features Oakley’s patented no-slip Unobtainium® material used on the nose pads and temple tips (behind ears) to prevent slippage. The snug fit is a key component to a good pair of tennis sunglasses since you don’t want them sliding down or falling off just when you are going for a shot! The material is designed to keep the sunglasses properly fitting even when you are drenched in sweat! The rims are semi-rimless, meaning the bottom of the frame has no solid rim. The open design on the bottom of the lens is a plus when you are looking downward- this is a big benefit for racket sports since it gives you a less obstructed view especially down angle- like the bounce of the pickleball serve. 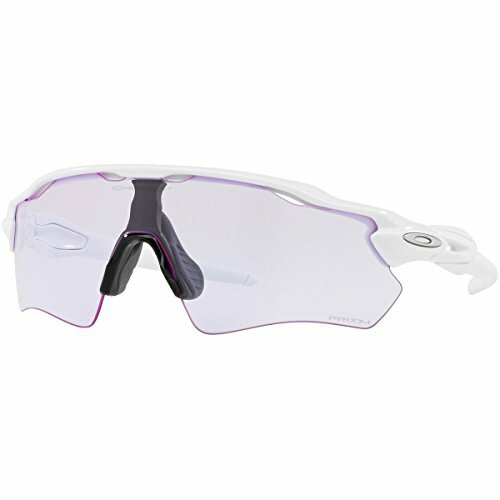 The Half Jacket has the Interchangeable lens system making it compatible with Oakley lenses. The extra set(s) of Oakley interchangeable lens would need to be purchased separately, if for example you wanted to swap out different colored lenses for different lighting conditions using the same frame. I personally don’t mess around changing lenses but it is a cool option to have if you’d like different colored lenses to choose from. *Compatible with Oakley Authentic Prescription Lenses. Majority of buyers won’t bother with interchangeable lenses. So this isn’t really a negative mark against these glasses, just probably a feature that only a minority will take advantage of. The names get a little confusing, but this is the Oakley Flak Jacket (compared to the “Half Jacket” above). Prior to the arrival of the Flak Jacket, the 1/2 Jackets were historically Oakley best-selling sunglasses. While both models still sell well, many people see the newer Flak Jackets as an upgrade from the older model. The overall shape seems to have a better chance of fitting the average face shape. The lenses provide slightly more peripheral coverage. The temple hinge seems to have a stronger, more lasting construction. The temple tips are more flexible than the half jackets (more comfort behind the ear). Flacks come with a hard case (1/2 jackets come in a micro-fiber sash). The mounting tabs (where the top of lenses attach to the frame) seems to be more solid, potentially giving the glasses a longer lifespan. Having said that, many women readers have commented that they prefer the HALF Jacket, due to it’s smaller frame size. You can see a side-side comparison of them in the video below. The Half Jacket also comes in this stylish frame with a red accent (click to see more photos on Amazon). If you are shopping for Oakley’s the naming conventions can get a little confusing. Just remember that the “Standard” vs “XLJ” vs “XL” is strictly referring to the LENSES, not the frames. Both the Oakley XL and XLJ lenses are longer than the standard lenses and the XLJs have a wave-like cut along the bottom. The XLJ lenses provide slightly more coverage than the standard Oakley lenses. Like the Half Jacket, these Flak Jacket glasses are compatible with Oakley Authentic Prescription Lenses. If you are trying to decide between the Flak Jacket and Half Jacket (2.0) here is a quick and useful video with a side by side comparison. Bollé Performance Eyewear ….or just Bollé is known for protective eyewear. I originally came across the company while skiing as they are one of the top brands selling ski goggles. In 2001 they were bought out by Bushnell Corporation (well-known brand for quality binoculars). In addition to protective eyewear and ski goggles, Bolle has a wide range of sports sunglasses. For tennis or pickleball, my top pick from Bolle’s product line would be Bolle Bolt Sunglasses. These are sleek frame style with wraparound temples. The shatterproof polycarbonate lenses are lightweight and feature anti-fog treatment and mirror finish-all advantages when shopping for a pair of tennis sunglasses. The lenses are available in polarized and non-polarized versions. There are plenty of style choices with these sunglasses as the frames come in black, white and orange and there are lenses available in amber, grey, green, black and rose. So just as an example if you see a product called: “Modulator Green Emerald Oleo AF“.These lenses would be photochromic (darken when exposed to light) since it mentions “Modulator“, green colored with anti-smudge (Oleo) and anti-fog (AF). I would not expect these glasses to be polarized since by default they are not- the product name would normally specify “polarized” in the name. But, the problem I have with recommending some of their models is the PRICE! Some of their newer models (like the Nike Vaporwing) sell for just under $400! Unless I were an elite athlete (getting free sponsorship gear) I really don’t see wearing glasses this expensive. If I had to pick one pair of Nike sunglasses to wear for tennis it would be the Skylon Ace Sunglasses. The Skylon Ace is a straightforward, comfortable pair of sunglasses at a pretty affordable price point. They have a sleek shape with a snug enough fit to wear while being active but a little less extreme “wrap” than the other models we’ve reviewed above. Some of the previous reviews were for glasses with the typical sports style wrap around (almost straight temple design that curves around and hugs at the back). The nose bridge has horizontal grooves that provide ventilation, which help keep the inside of the lenses from fogging and lets the glasses vent a little more which is a nice feature when you are in the hot sun. The Under Armour Ignitor 2.0 is the least expensive pair of sunglasses on our list and deserves a closer look. I do believe to a certain extent you “get what you pay …” but on the other hand, there’s no reason to think you have to pay top dollar for a designer pair of sunglasses to play on the courts. While I wouldn’t trust my eyes to a discount brand of glasses that I’ve never heard of -just to save $20, Under Armour is one of the leading sports brands and they are known for quality gear. Like the rest of these glasses on this list, the UA Igniters do offer 100% protection from UVA, UVB & UVC. A unique feature on these glasses are the fully adjustable nose pads which help give you a more customized fit. The Igniters are noticeably lightweight and comes in a wide selection of frame and lens color combinations. Click here to read the most recent reviews on Amazon for these glasses. Although some glasses are marketed as gender-specific and that makes a lot of sense for fashion sunglasses, many of these sports sunglasses on the list are unisex. Of the glasses on this list, the Oakley Flak Jacket may be considered men’s sunglasses because of their slightly more chunky profile whereas the Oakley Half Jacket is preferred by many women because of it’s a more feminine frame. 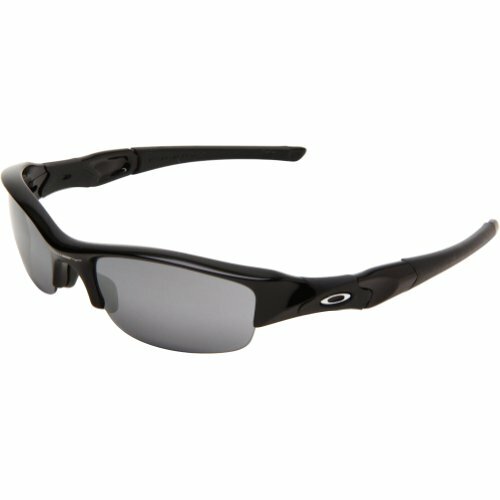 I think that any of these glasses could be worn by equally by a man or a woman but if I had to choose one from the list as best women’s tennis sunglasses I would choose the Oakley Half Jacket. Another nice thing about these is if you are looking for something more feminine, they do also come in other styles such as a white frame with violet color accents – if you’d rather not have the masculine all black Arnold-Schwarzenegger-I’ll-Be-Back” type look. Don’t forget about younger players! According to the U.S. Tennis Association (USTA) participation in youth tennis is growing and there are an estimated 4.5 million active players in the US between the ages of 6-17 and there are also more kids and teenagers are playing pickleball. Unfortunately, kids are often neglected when it comes to quality sunglasses. I often see young kids out playing in the sun without sunglasses and when they do have them they are usually more like toy glasses. Kids deserve to have high quality, comfortable glasses that block 100% of UV. Over their lifetime they will spend a lot of time in the sun and are susceptible at a young age so I think it’s much better to get in the habit early. 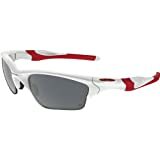 The Oakley Quarter Jacket Iridium Sunglasses (Youth Fit) or the would be one of the top picks for quality youth sunglasses. Recommendation from my teenage son: Under Armour Youth Nitro (disclosure- he is a basketball player, Steph Curry fan and understandable he loves all Under Armour gear- but I do agree they do make good quality gear at a decent price). 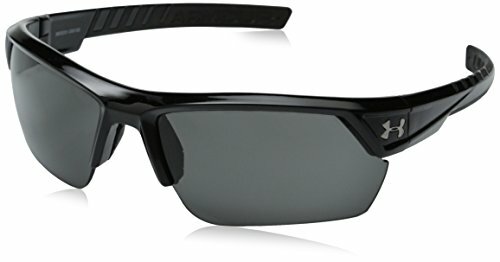 Although I prefer the wrap around style sunglasses when playing racket sports- because they cut down on light coming in from the sides and glare when the sun is behind you- I can understand some people don’t like the look or feel of the wrap around temples tips or “arm” (the back part of the glasses that wraps around the back of your ear). Also the more of an all-around style that could be worn off the court without looking like a “sports” sunglass. If you prefer a more squared off frame but still want a sporty pair of sunglasses with 100% UV protection and lightweight frame, take a look at the Oakley Jupiter Square Sunglasses. They come in Non-Polarized and Polarized versions. One of our readers, Veronika, recently asked for a recommendation on sunglasses for playing in low light conditions. This is a great question since it’s a relatively common scenario. For those times early or late in the day when the sun is low in the sky but still bright enough to be a bother. The sun is at an angle that hits you straight in the eye- so you want to shade your eyes from the glare- but regular sunglasses darken your view too much to play effectively that you have to take them off. Whether you are an early riser and first ones on the court or playing in the evening and just trying to get in that last set of the day while the sun is about to set, lenses specifically made for low light conditions can the best solution. Oakley makes a lens specifically for this: the Prizm Low Light Lens. This lens is used on a variety of their models but the ones that I think are probably the best match would be the sports/wrap around models such as the Oakley Evzero and the Oakley Radar. Just make sure you specifically select the PRIZM LOW LIGHT lens option since these glasses come with a number of different lens options. The sun’s UV radiation can cause cataracts, skin cancer around the eyes and even cancer of the eyelids. It can also cause “snow blindness (photokeratitis) which is a temporary yet very painful sunburn on the cornea. Hats, even wide-brimmed ones can only block about 50% of the UV radiation that reaches your eyes so the best prevention is to wear sunglasses, especially wrap-around sport style glasses that cover the sides of your eyes also. Long-term exposure to the violet and blue portion of the solar spectrum reaches deeper into the eye and could increase the risk of age-related macular degeneration (AMD). Dark Adaptation: Even a couple of hours in bright sunlight can limit the eyes’ ability to adapt quickly to nighttime or normal indoor light levels. This can make night driving more dangerous. A 5th and important reason that I’ll add is to protect your eyes from dust and dirt and flying debris in the air. I won’t give you the whole long story but it starts with me going out for a leisurely stroll on a bike several years ago (no sunglasses on)…and ending up in the ER for several hours. Basically, some tiny speck of dirt got in my eye and by rubbing it, I managed to get it lodged deeper under my eyelid, scratching my cornea (corneal abrasion) in the process. Luckily I had no permanent damage to my vision, I spent the next several days wearing an eye patch and using eye drops for weeks (not to mention the whopping medical bill from the ER visit). Lesson learned: I always wear sunglasses now when I go out during the day. Sunny or cloudy days -whether I am playing pickleball or just running a quick errand. Even regardless of the bad luck I had with the dirt getting in my eye, skin cancer prevention is more than enough reason for me. I’ve written about skin cancer before on the blog before, I take as many precautions as I can to minimize the chances. Unfortunately, according to The Vision Council, although 3/4 of Americans say they are concerned about the effects of UV exposure only 31% always wear sunglasses when outside. For me personally, and I’ve repeated this several time on the blog, for me a good pair of pickleball shoes and UV protection (glasses and sunscreen) are more of a priority than getting the newest paddle on the market. Should block 99-100% of UVA / UVB / UVC radiation. Should screen out 75-90% of visible light. Should be shatterproof (Polycarbonate or other impact-resistant material). Although there are a variety of lens tints that can work for sports glasses, gray lenses are a top choice to deliver clear color vision is grey. So you might be thinking: if the pros are not wearing sunglasses, why should you? Let’s keep in mind that the real reason for wearing sunglasses when your outdoors is to protect your eyes- not for enhancing performance. We mentioned above (skin cancer, macular degeneration, snow blindness, headaches, squinting, etc), those are much more important to consider! Grey: Best tint for true color perception and highest light reduction. My top choice for Tennis/Pickleball. Blue/Purple: Aesthetically pleasing and trendy color for lenses. Best known for enhancing color perception. I would not wear for pickleball or tennis sunglasses. Pink: Red and pink lenses offer the greatest level of contrast and can be stylish but I would not select these for sports in general so not a great pick for sunglasses to use for pickleball. Photochromic lenses: These sunglasses automatically lighten or darken depending on changes in light level. You may have seen these before- someone walks indoors with sunglasses and you see the lens noticeable change from dark to light to adjust for the indoor light. Although this is not a feature I go for, they could be useful if you are playing tennis or pickleball for several hours -especially early or late in the day when the sun is rising or setting and there is a significant change in light conditions while you are on the court. They can also be useful if there are changes in weather conditions since the photochromic lenses will adjust to let more or less light to enter your eyes for good vision. I personally don’t like them for because if playing in partly cloudy conditions, the lenses constantly adjust as clouds move overhead but it’s really a question of personal choice. Polarized Sunglasses: these have a special filter to blocks light reflecting from horizontal surfaces thereby removing glare or hot-spots. I bought my first pair of polarized lenses to go fly-fishing and I was amazed when I put them on. They are very good blocking glare from reflecting water, snow and other flat surfaces like concrete or sand. If you have ever fished with polarized glasses you’ll know it- you can actually see clearly into the water and can “spot” the fish underwater. I personally love polarized glasses- especially when I am around water or snowy conditions. But it’s an optional feature and if you’re buying sunglasses for pickleball or tennis (hopefully no water or snow on the court 🙂 – you really wouldn’t need polarization on the lenses. Anti-reflective Coating: Some glasses come with an additional surface layer to reduce sunlight glare on the inside of the lens (for sunlight coming from behind you). Although this is a nice extra feature, choosing a wrap-around style frame should also remove most backlight since the glasses fit closer to the sides of your face. Mirror Coatings: can block an additional 10-65 percent of visible light. These are really useful for full-sun environments where you are surrounded by highly reflective surfaces-most notably snow. I would only really wear these when out in the snow (I grew up in Minnesota- so lots of SNOW and ICE: snowshoeing, outdoor hockey, cross country skiing, downhill, ice fishing…you get the idea! I skip the mirror coating for all other conditions – I find them too dark. At the pro level, the ball is moving extremely fast. Rafael Nadal regularly serves that ball over 125 mph (200 kph)…and he is not even the fastest serve on the tour! At those speeds, any changes in your perception of depth of field, interpretation of ball spin or velocity of the return…or changes in visual clarity or light could have a very negative impact. Pro players need to be at the top of their game and remove and obstacle that can get in their way. The frame on the glasses can block a small portion of their field of view. Changing light conditions from clouds moving overhead, changing sides after sets, or the waning light towards the end of an evening match could throw off their perception. Although these may be slight differences, at the pro level it can have a big impact. A pro player may need to worry about slight changes in light or the frames possibly blocking a tiny sliver of their view but they are also returning serves speeding at them at well over 100 miles/hr. For most of us mere mortals, it’s simply about protecting our eyes! I hope this buyers’ guide and the top sunglasses review have provided some useful information to help select the best pair that work for you. Regardless of your personal preferences on style, lens color, etc. it’s important to protect your eyes whenever you are outdoors. Any of these sunglasses would be a good match for outdoor racket sport including other sports such as paddle-ball or platform tennis. The important thing is that they offer full protection against UV light and have a shape and design that works for active use and won’t fall off in the middle of a set. Other articles that may interest you: Finding a good pair of court shoes and the importance of wearing a comfy pair of tennis socks and What is tennis elbow and some ways to alleviate the pain. You don’t mention which of the brands you reviewed allow prescription lenses. Do all and if not which do. Thanks much for a cogent review. Oops, major oversight on my part! – not clarifying which glasses are prescription ready. I wore contacts/glasses for decades but had Lasik surgery done years ago and forgot how important it is to find good prescription sunglasses! The Oakley Half Jacket 2.0 and Oakley Flak Jacket work with Oakley prescription lenses. Bollé Bolt (“S” model) is also prescription-ready. I don’t think the Nike or Under Armour have RX option, but I will go thru and update the article as soon as I can. Thank you for the great overview. I came across your blog while looking for some tennis shades for a night play. The contrast of such bright light and the darkness around seem to be my issue. Do you have any recommendations? Oakley makes the Prizm Low Light Lens which is an option on some sports/wrap around models like the Oakley Evzero and the Oakley Radar but you want to make sure you specifically select the PRIZM LOW LIGHT lens option. I play indoor pickleball and the fluorescent lights really affect me ie at times, I can scarcely see the ball. There is a brand called TheraSpecs that are designed for fluorescent lighting but are really marketed to people with migraines so not sure you really need those, plus they are pretty expensive ($200). Another recommendation is to use “blue-blocking” lenses but those are more for gamers/people on the computer at night, I think they might be too dark for pickleball. They are rose-tinted and specifically designed to increase contrast- so it seems to me those might be the best place to start. Let me know what you decide on and how they work out for indoor pickleball – might be useful for other readers.